With Duchess Satine as bait, the vengeful Darth Maul lures Obi-Wan into a trap. Drunk with power, Maul declares himself the true Sith Lord, a claim that will not go unanswered in "The Lawless" airing this Saturday, February 2nd at 9:30am ET/PT on Cartoon Network. · This episode marks the first appearance of Darth Sidious "in the flesh." In all other appearances, he has been a hologram. 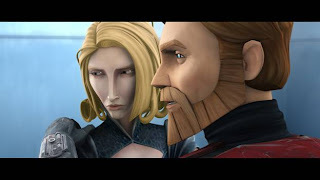 · Obi-Wan Kenobi is wearing his Rako Hardeen disguise (from Season Four's "Deception" arc) when he arrives on Mandalore. · The much battered Twilight now sports a cartoonish illustration of Anakin as a boy Podracer pilot, with Aurebesh text that says "WIZARD!!!" The Twilight has not been seen since Season Two's "Children of the Force." Obi-Wan Kenobi. Duchess Satine. Darth Maul. Savage Opress. And another certain Sith Lord. Saturday's episode of The Clone Wars, "The Lawless," will change the show forever. To mark the occasion, Lucasfilm is excited to announce The Clone Wars Google Hangout -- the first ever official Star Wars Google Hangout -- taking place this Saturday, February 2, at 10:30 a.m. PST. Featuring The Clone Wars supervising director Dave Filoni, Matt Lanter (Anakin Skywalker), Ashley Eckstein (Ahsoka Tano), and Sam Witwer (Darth Maul), fans will get the chance to connect with the cast and creators of the hit series like never before. They'll also get an exclusive first look at next week's installment of The Clone Wars, "Sabotage," along with other surprises. Fans with Google+ profiles can RSVP for the event now; hashtag #CloneWarsHangout will be used to ask questions and interact live during the Hangout. Lucasfilm's own Pablo Hidalgo and Hollywood.com's Christian Blauvelt will moderate the discussion, and a live stream of the event will be open to everyone at youtube.com/starwars. Tune in to "The Lawless" this Saturday at 9:30 a.m. on Cartoon Network, and then join the The Clone Wars Hangout to get your questions answered. Secrets will be revealed, and it will be a day long-remembered! Click on this link for a brand new sneak peek at "The Lawless"